The only thing less popular than Congressional approval ratings is the White House’s attempts to get us involved in Syria. All the Gallup polls are telling the President that we do not want to arm the rebels or drop bombs. I was pleasantly surprised to hear that not even Congress wants this war. That probably has a lot to do with the scores of people crying out to their representatives, “No more war!” This is a perfect example of why we must never give up hope. If we actually take time to contact our representatives and let our voices be heard, we can change things! They seem to think we’re all too stupid to get what’s going on. If only we knew what they knew, then we’d approve of the strikes! But of course, all of that information is classified. Even so, Rep. Alan Grayson is telling us that many of the most informed policy makers were strongly against the strikes. A June 2013 Gallup poll found that 54% disapproved of supporting the Syrian rebels while only 37% approved. This isn’t surprising as we’ve heard this story before. It’s become cliche by now. There’s some evil middle-eastern dictator using terrible weapons on his own people and we need to go in there to save them. It’s the exact same scam they used on us with Iraq. If you listen to Secretary of State John Kerry, supposedly we’re going in there to save innocent women and children from Assad who is using chemical weapons on his own people. Then a funny thing happened. A reporter asked Kerry what it would take for us to stand down. What are we wanting Assad to do? Kerry told the crowd that if Assad hands over his chemical weapon arsenal, there would be no military intervention, but he assured us that would never happen. Lo and behold, Russian President Putin talks with Assad and Syria agrees to hand over their chemical weapons. Now the White House is in a real bind. With Assad willingly handing over the weapons, the public is wondering why we need to be over there at all. Even so, we can see President Obama along with Secretary Kerry pressuring Congress to approve the war. What in the world’s going on? There’s an explanation for this. Let’s step back to the September 11th attacks. George Bush then filled his administration with neo-conservatives who had been lusting to rebuild the middle east since the 1960s. To ensure that their plan would survive even after they were out of office, they installed key leaders into the U.S. military industrial complex to fulfill that mission long after they’re gone. How do I know this? I’d recommend you all watch Adam Curtis’ documentary series The Power of Nightmares, produced by the BBC. It talks about the rise of neoconservative power, even interviewing key members like Richard Perle, a top adviser under Bush and Reagan. Curtis asks him if Bush’s middle-eastern policies will survive the end of his second term. Perle assures him that they’ve installed their people into all the key positions within the Pentagon, CIA, and other key military offices. 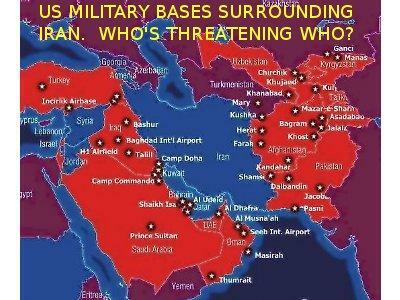 Take a look at this map of U.S. military bases in the region. Take close notice of Iran and Syria. See all the U.S. military bases in Afghanistan, Pakistan, and Iraq? We’ve been hard at work these past ten years or so. But Syria and Iran have not yet been conquered. They were next on the list, but people are wising up to all of this. We don’t want bases or conquest. We’d rather see those trillions of dollars spent at home on things such as our failing infrastructure. So why did the Russian president get involved? Well, Russia and China both have been concerned about the eastward march of NATO ever since World War II. Slowly their countries are being encircled by the United States and our allies. This is why Putin has been supporting both Syria and Iran. Here’s a map of NATO nations. 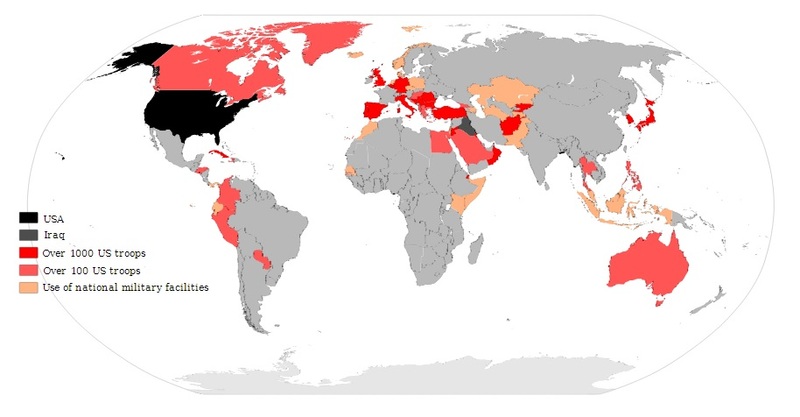 And here’s a map of U.S. military bases around the world. You can see that we’re slowly moving into the Middle East, building bases to both control Middle Eastern oil as well as encircle Russia and China. You have to remember that Russia and China are their own thing. They are far more self-sufficient. When we were all suffering under the madness of the financial crisis, they were unaffected. They’re not as closely tied into our institutions, though they do peacefully trade with the rest of us. Here is a clip from a few years back where Secretary of State Clinton is annoyed with Russia and China for protecting Syria. Putin actually ran his campaigns telling the Russians that he would not submit to powerful foreign interests wanting to subjugate their people. He’s been expanding his military arsenal to send a clear message, “Leave us alone.” He’s also been testing and building ever more powerful nuclear weapons. This next clip from 2008 is of President Putin speaking about NATO’s eastward expansion. President Putin just recently attempted to reach out to the American public in a personally written op-ed piece which he submitted to the New York Times. He makes a lot of interesting points. He basically says that if the United States continues to ignore international law and the United Nations, there is no where for countries to turn for justice and protection. Their only alternative is to develop nuclear weapons programs to ensure their protection. In the past President Putin has condemned NATO as a giant coalition of powerful countries ganging up on weaker countries, forcing them to conform to their wishes. That’s exactly how they view what happened in Libya just a short while ago. In this clip Noam Chomsky offers similar perspectives on NATO, basically pointing out that it’s a U.S. led coalition to protect and control Middle-Eastern oil as well as sea lanes. All of this being said, I don’t think any of this is about the poor children who got gassed by Assad. It’s about power and conquest. Different world super-powers are flexing their muscles, protecting their interests. Our foreign policies are making the world a more dangerous place. Our invasions of Afghanistan, Pakistan, and Iraq have led to a rise in radical Islam and extremist terrorists. They want revenge for all the innocent civilians who have died. And while we’re claiming to save the women and children of Syria, in actuality we’re putting the entire world at risk. Our unilateral action against weaker nations is escalating tensions with other sovereign nations who fear they’re next. They’re therefore building up their militaries and nuclear arsenals, preparing for conflict.